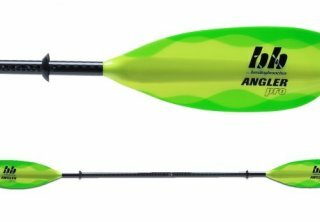 "This is the best paddle I have ever used in 19 years of kayak fishing. If you want performance this paddle is the way to go. Very light but yet durable in the water. " 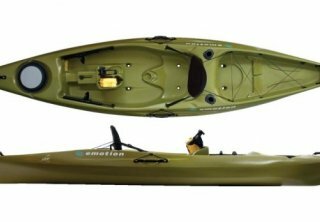 Emotion Kayaks "Stealth 11 Angler"
"If you are looking for a quality fishing kayak in the $500 range this one is for you! You can accessorize it with many items. Easy to navigate, speed is phenomenal, and transporting it is a breeze. I have taken one out more than 100 times this year and durability is outstanding. We have paddled over rocks in turbulent water as well. 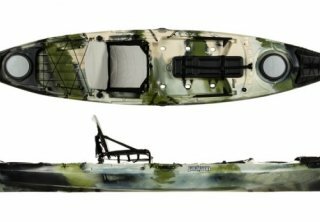 Very comfortable and the seat area is much higher than that of the..."
"I've used many paddles throughout the years and the Bending Branches Angler Pro is the best "two stroke" motor so far! The ease at which you can paddle the 240 cm paddle is incredible. With the light weight of this paddle it is difficult to wear you out. I have pushed off many rocks and no apparent damage to the edges at all. If you want performance this paddle is for you!" "I have been impressed with Yak-gear since my first purchase a couple years ago. They have been easy to work with by phone and even sent a few extra things with my order! 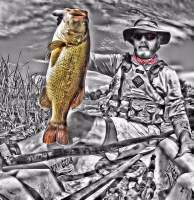 They are knowledgeable about the sport of kayak fishing and get products out quickly! Their "how to" videos are excellent as well." 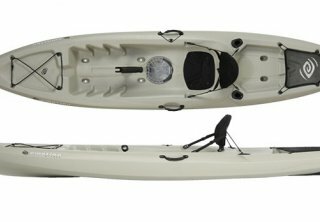 "Overall very comfortable kayak for those longer days in the kayak. Very stable and can get into back waters very easy. Storage area is adequate. Easy to add accessories. " "The Emotion "Mojo" Kayak is one of the most comfortable kayaks I have ever paddled. There is lot's of leg room and the "sink" gives you plenty of space to work. There are adjustable foot peddles for the length of your legs. The "Mojo" does come with a removable center console. I like to remove it for more comfort. The seat is built in and the seating area is very comfortable. There are two..."
Each year we seem to want a renewel of our efforts by setting new goals or resolutions. We are excited to set them and a lot of times they disappear into the busy lifestyle that soon overtakes us. My kids and I usually set an "outrageous" goal each year. One of my sons set a goal to make 50,000 shots in the summer. The other, to run 400 hundred miles during the same time period. Both achieved this goal and I set my goal at 2013 fish two years ago. I failed, but not by much. Then in 2014 I tried again and came up short. This year was no exception. The challenge was more diffficult than ever due to a move clear across the state of Nebraska and new fishing waters during late May which is some peak fishing time around here! I kept chipping away throughout the summer and fished more than ever this past Fall as the temperatures stayed very mild and water was open up until around December 28. On December 31st during the afternoon hours I needed just 41 fish to reach my goal of catching 2015 fish for the year. I had a friend who guided me to a small farm pond loaded with green sunfish. There was 3 inches of ice so we drilled some holes and sure enough they started biting. We caught them right away and it only took a couple hours to reach my goal. After 101 trips (99 by kayak) I had finally reached this milestone! It was a great relief to reach it and many new friendships were made along the way. Kayak fishing has taken me outdoors and helped me develop friendships I would have never made. I am grateful for accomplishing this challenge. I am looking forward to going after 2016 fish this year! 449 Largemouth Bass (3 Master Anglers) Longest 21"
49 Channel Catfish (15 Master Anglers) Longest 35.25"
24 Northern (12 Master Anglers) Longest 37"
and 1 Bull Frog on a Frog! *All of these fish were released except for a few crappie that I handed to some people on shore or gave to friends while fishing. I want to thank my sponsors, Yak-Gear.com, Bending Branches, The Boat Dock, and Emotion Kayaks who helped make this challenge possible. Just who are these guys they call the "Corn Coast Anglers?" We know they are from the Eastern Nebraska area for sure but how do they catch so many BIG fish? Many would say their time on the water and others might say it was luck. Luck is far from this painted picture as this group consistently brings in so many mosnter fish. Online kayak fishing tournaments are known to expose quality anglers and these brothers are no exception to this rule. Introduced to the sport of kayak fishing just a few short years ago they have taken the "plastic navy" scene by storm. If you have ever had the opportunity to fish with any of these guys it's a real treat. They are fishing "addicts" of the worst kind and yes, we mean that in a good way! They are meticulous, patient, persistent, and knowledgeable when it comes to fishing and with a kayak....remarkable! They are also good natured and are willing to help anyone. Each brother has his own set of characteristics and strengths that go beyond being an average fisherman. Kevin seems to be the most "laid back" and fairly quiet most of the time. But don't let that fool you! He is one of the most passionate and competitive fishermen we have witnessed on the water. Also known as the "Dark Archer" Kevin consistently catches trophy fish from the kayak. He is a detailed planner and applies strategies that will boggle the mind. As the winner of the 2014 Midwest Kayak Fishing Series he has proven he is capable of competing against the best kayak anglers in the world. He is a very kind man and great Dad to his kids as well as an awesome husband to his bride Megan. Then there's Joshua a driven young man who gets right after it when it comes to kayak fishing. He will find fish and do whatever it takes to get a monster. His recent achievement landing a 44 inch flathead catfish the final evening of the June Multi Species contest which is part of the Midwest Kayak Fishing Series was beyond spectacular. His personality reflects mastery of the sport in so many ways. Now Caleb can remind you of a modern day "Huckelberry Finn" with his bare feet and shirtless back He is also relentless when it comes to kayak fishing and if you could name one major strength about him would be patience. He is a free spirited man that thakes his game serouulsy but at the same time makes us want to take off our own shoes to enjoy the paradise Nebraska waters offer. The Corn Coast Anglers are a group that includes other incredible anglers as well including Clark and Jenn Dawson who have a "top gun" game of their own. This group has published numerous adventurous videos that bring their trips to life in a way not ever seen by the camera eye. If you want to experience fishing in a way like never before hook up wiht these guys..you can even leave your shoes at home! The Buff. An integral accessory to the modern day kayak fisherman. A few years ago my son CJ and I received the YakAngler buff. We noticed them on the Survivor Series shows and were always intrigued by them. We never thought we need them as much as we do today! They have multiple uses such as protecting your face, ears, and neck from damaging sun rays. The buff is great for those cold days as well. They can be dipped in cool water and placed around the neck to keep cool on those hot days of summer. One other practical use is protection from bugs! Just yesterday CJ and I were fishing a local pond and this time of year there are knats by the thousands that fly and crawl all over us creating a nuisance and hindering our fishing from the kayak. The buff works great! There are numerous ways to cover your head and the buff is perfect for this task! If you are looking for added protection get yourself a buff and better yet, if you would like to support YakAngler get one of theirs today! It was a typical early spring day here in Southwest Nebraska. The air was cool from the front and snow shower that passed the night before. The crappie bite had been pretty good earlier in the week but the cold temps that hit us this week would make the bite very slow. My son CJ and I launched just after lunch and thought one of our favorite ponds just outside of town would produce some nice crappie today. After an hour we didn't have a bite and CJ took to playing on the shore with his paddle producing a sand project. I knew he was a bit discouraged but happy to be out for some fun with nature. We loaded up as the north breeze continued to keep things cool and clouds keeping the sun from warming the waters. On our way home I asked him if he wanted to try another pond that a friend had told us we could fish. CJ was all in and we noticed the friend was home so we pulled up and asked permission. Our friend took us up to the pond which was no bigger than a basketball court. He gave us details and told us to enjoy the fishing. This little spring fed wonder was 14 feet deep and chock full of fish! We left the kayaks on the trailer and fished from the bank. CJ was throwing a couple crappie jigs while I put together my fly rod. We both had fish on the first cast! It was "game on" after that as we produced more than 100 catches between us in the next hour and a half. Most were small green sunfish and a few bluegill. The best part was watching CJ have so much fun catching them and trying to get his notorious "double catch" with a fish on each jig as he brought his line out of the water. The sun did shine through and kept us warm out of the breeze in this peaceful climate. Sometimes fishing is not really the "fishing" but the "bond" built between father and son on a glorious spring afternoon. Then local Ron Pursley showed up with his guitar! These guys were amazing as they tuned their strings and played a few songs on the shoreline.. They entertained as CJ fished for more Browns...It was a memorable evening and we are ready for many new adventures on the horizon! Tis' the season for cold water. While most fishermen have put their kayaks away for the winter some are still out getting the most out of the low percentage of open water left in the northern states. Southwest Nebraska is no exception. The water is cold and some waters frozen over but there are a few spring fed lakes that tend to keep water in the high 40 degree range. This past Thanksgiving weekend we had an unusual couple of days in the 70's with the surface water temperature soaring to nearly 55 degrees. It was a great time to launch the kayak and try out one my favorites...the Cumberland Sunny Square Bill crank. My sonar located numerous fish stacked up in the creek bed with vegetation around 5 foot from the surface. With a slight current and bluegill in the area the bass were sure to liven up with the addition of a Cumberland Sunny wobbling just above the weed line. Sure enough! It didn't take long to land a largemouth. Most were "ditch pickle" size but the fun was in catching them. The technique used was not the same as in the warmer summer months. When the lure hits the water I usually draw it down to around 3-4 feet and let the lure pause and float back up slowly. I repeat this action until I feel the tug of the weed line which helps me retrieve just above this depth. The strike feels almost like a snag. The fish put up a good fight but in the beginning they don't really run but give one good tug and then the shaking begins. Even in the mid winter months we still use the cranks effectively as the water gets even cooler. . I just use my sonar to find out where the water warms and the bass are usually not far away. The bait fish tend to hang out in these warmer areas with the larger bass not far behind. For those who love to crank the cold water can still be a great time to catch those lunker bass. Texas, everything is bigger in Texas…right? Lake Fork Bass are no exception. These Florida strain monsters lurk in the “Fork” in huge numbers. So when “Tournament of Champions” director Beau Reed of Austin was looking for the ultimate lake for a “world championship” event he found a gem. This was a tournament meant to bring in the “best of the best” kayak bass fishermen in the world. It would end up drawing anglers from 14 states in it’s inaugural 2014 event. Fishing Lake Fork was on my “bucket list” so when the opportunity came up to fish this tournament I didn’t hesitate to commit. My journey started way back last April fishing in the Midwest Kayak Fishing Series. That was a four month series with a separate challenge each month culminating with a live event at Lake Wanahoo in Nebraska. My journey is just one of many other kayakers who would make the trek to Lake Fork this November when the bass are fattening up for the winter season. I finished second behind legendary Kevin Workman in the Midwest Kayak Fishing Series who would eventually enter as well. The top five of this series would end up qualifying for live event at Lake Fork. There were a couple other tournaments in the Midwest that fed qualifiers to this world class event as well being the Kayakapalooza V and the Bass Pro Shops Pony Creek Challenge both of which I helped organize. I had only been to Texas twice previously in my life, once to Abilene for a national championship track and field meet while attending college and the other in Dallas International Airport just a year ago in route from a San Diego educational trip with the US Marine Corps. I had no idea where this trip would take me. I teamed up with kayak fishing friends and qualifiers Raf Vargas of Bellevue, NE and Kevin Slifer of Wamego, Kansas to cut down “windshield” time. Raf qualified in the Kayakapalooza V and event. Slifer also placed the Midwest Kayak Fishing Series. The first step was taking time from my teaching job to meet these two great anglers in Wamego, Kansas three days before the event. It was a 6 hour drive to Wamego from Southwest, Nebraska where I took off right after school. It was very late in the evening before I reached my friends and we reloaded to make the eight plus hour trek south to Lake Fork just east of Dallas, Texas. I would end up being awake for more than 30 hours straight with all the anxiety an event of this caliber brings to one who is very competitive and loves to fish from a kayak. We talked about the event and our strategies as well as the future of kayak fishing. We have all become great friends through the sport of kayak fishing. A far cry from when I first started in 1998 and people would take a double look at my quests most of the time on the area lakes. People were bewildered by a guy fishing from a kayak in the early 2000’s here in Nebraska. When we arrived Lake Fork was all that we had expected. The air was dry and felt great! It was a sunny day with a brisk breeze out of the south. We pulled up to the Lake Fork Marina and met some great folks in the local shop there. We purchased our fishing license and picked up a few items before backing into our campsite just across from the hotel rooms which would soon fill completely up with kayakers who traveled many miles to compete against the best in the country. We pitched camp and readied our kayaks for some “pre fishing” on the lake. I was the last to launch of our group and it felt good to paddle on this legendary lake. Thus, my bucket list was checked. But not completely for this challenge! I still needed to land a Lake Fork bass! It wouldn’t take long. I hooked into a nice fat 17 incher back in a bay that was full of baitfish. I tried a bit deeper but no takers there. I paddled back to shore and readied for the next day of fishing with a local guide. Brooks Rogers is an expert on this lake and there were four of us who fished with two embarking with another guide Mark. Kevin Workman and myself headed out with Brooks on a brisk windy morning that chilled the bones. Our main purpose was to get to know the lake and eliminate some water before the tournament on the next day. There was a qualifier going on today as well with several kayakers still trying to make the field. The bite was very slow but Brooks and Kevin both landed some nice lunkers. We got a great feel for the lake and made plans for the next day. The other guide and Kevin’s brother and grandfather found some bass lurking in the grass along a bank but the bite was slow there as well. The creeks seemed like they would hold bass but we would end up going after the grassy areas the next morning. It was very cool again at 4 am for the captains meeting and then we embarked at 5 am to our spots. The field was around 54 anglers. The best part of this whole trip was launching at a little after 5 to our location. The water was calm and it was very dark. I would paddle around a half mile across a fork of this legendary lake hoping not to run into any protruding stumps that stick out of the water by the hundreds on this lake. I was ready but soon after I arrived at my location the sonar on my craft went out. I should have changed batteries but in anticipation of the fishing I failed to do so. I knew the area from the few minutes I had with the sonar and when 6 am hit I made my first cast. Nothing. The baitfish were everywhere and I thought the place would soon erupt with big fish. Nothing. Then a few minutes later I hooked into a lunker! Not even a couple seconds and the line broke. Once again, technical failure…my knot came loose! I was very disappointed in myself at this point. Then I went to another rod with another Carolina rigged Power Team Craw. Nothing. A couple hours passed and still nothing. Then I hooked into another one that picked up a swim bait I was throwing. It came back right at me and my line tangled with another rod laying over the bow of my Jackson Cuda 12 provided by the Boat Dock of Grand Island, NE. Another disappointment as I could not get the line loose and the fish disengaged itself quickly. I fished another three hours with not even a bite. I figured I would go to the other side and fish the deep water. There I noticed other boats and kayakers. I saw two guys in a boat land a huge bass and then Kevin Workman came trolling by and looked to have a huge fish on as well. I was throwing a spoon and hooked into another fish only to have it get loose as well. This would be the last fish I hook into that day. I met the other kayakers and got a ride back to the marina where many other exciting stories were told. The awards took place and there were some nice catches recorded. I ended up with a “skunk” and it sure felt big! Others would have the same result but all were excited just like me to have fished in this great tournament. I am looking forward to qualifying again next season and try my luck at this lake with others who are just as passionate about kayak fishing. I’m sure it will be bigger and better with a huge prize package at stake. In the meantime….I will fish my home waters and practice my bass fishing techniques and enjoying the peace and tranquility that kayak fishing gives the soul. With spring on the horizon the kayak fishing craze will soon be in full swing! Springtime temperatures will bring the fish back to the shallows, where lunkers can be caught while staging to pick off non-suspecting baitfish. Here in southwest Nebraska, the temperatures rise a little sooner than the rest of the state because of the arid conditions.